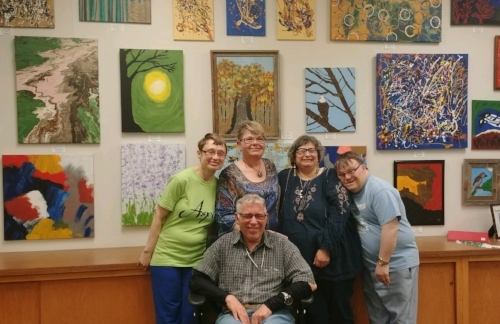 Creative Expressions artist cordially invite you to visit them at their Spring Art Show on Saturday, April 27th from 1pm-4pm at Aspire. There are over 200 pieces of original artwork displayed for sale at a range of prices. You will also be able meet the artist who created it! If you would like to learn more about Creative Expressions click here. Join us for our spring dance! Every donation makes a difference. Sign up today! We are excited to announce that Creative Expression artists have a display of their artwork at the Capitol Theatre. You will be able to see the display if you go to see a movie at the Capitol Cinema or if you attend an ACT play. We are so grateful to be a part of the wonderful community of artists in Aberdeen! Please consider giving to the 2018 Annual Giving Campaign. Click HERE to learn more and donate! For the first time ever, nonprofits and communities from across the state are uniting to celebrate generosity in the great state of South Dakota. Mark your calendars now to participate in South Dakota Day of Giving on #GivingTuesday, November 27, 2018. Aspire is excited to be a part of this wonderful movement of South Dakotan’s giving back to their communities! You can donate to Aspire by clicking HERE! Make sure you designate this as a #GivingTuesday gift. Creative Expressions artist cordially invite you to visit them at their Holiday Art Show on Saturday, November 17th from 1pm-4pm at Aspire. There will be a variety of original artwork displayed for sale as well as prints available for purchase. You will also be able to meet the creators of all of this fantastic art. Don’t miss it! The Special Olympics State Bowling Tournament is in Aberdeen at the Village Bowl from Friday November 9th to Sunday November 11th. Bowlers from all over the state come to Aberdeen to compete in this three day event – it’s very exciting! Consider coming out to support your friends or family members during this event. If you have questions, please contact Cheri Miller at 605-229-0263 ext 1020 or cmiller@aspiresd.org. Help us support the Aberdeen Chamber of Commerce in the Hat and Mitten Drive! Bring new hats and mittens or a cash donation to Aspire and we will get them delivered to the Chamber of Commerce by December 14th! Every little bit helps!! Come out and support Aspire Athletes at the Northeast Area Singles Bowling Tournament. This is the qualifier for the State Bowling Tournament and is always a wonderful time. Contact Cheri to for more information. See the Creative Expressions artwork in a whole new light at the ARCC Gallery! Join us on Monday September 17th at the Wylie Park Pavilion for a mystical night of magic! Tickets are $5 for the show and are available at Aspire, Inc (607 N 4th St) or at the door. Children under 5 are free. Celebrate our amazing employees with us this DSP week! Stop by the Aberdeen Farmers Market on the last Thursday of each month and see Creative Expressions. They will be showcasing their most recent works and prints and cards of their work will be available as well. Stop by for some beautiful artwork and great conversation. Check out the other vendors and shop local. Do you feel lucky? Buy a raffle ticket from the Aspire Foundation for a chance to win a Browning Citori Over Under Shotgun, a $500 Riddles Gift Card or $500 in Demkota Beef! The 3 winners will be drawn on Thursday, November 1st. Stop by Aspire or contact Janae Hamilton at 605-229-0263 or jhamilton@aspiresd.org if you would like to purchase a ticket. Come and watch this unique opportunity for people to water ski! Support Aspire with golf and good times! Aspire is hosting the 4th Annual Assistive Technology Fair on Thursday, March 22nd at Aspire. There will be assistive products showcased and new technologies to explore. We will have products that you can get your hands on along with breakout sessions highlighting the technologies utilized here at our very own Aspire! Friends and family are welcome to come and explore options for those in your life that may need them.